This weekend, I had the pleasure to go on my first bike tour weekend! Since I only had three days off, I decided not to go too far away: Zeeland. My friend Lisa, experienced bike tourer, joined me for part of the trip. At noon on Friday, I left from my home in The Hague to cycle to Renesse (a distance of about 75km) with my gorgeous Santos Travelmaster 2.6 packed with two Ortlieb panniers (all bought through Bike4Travel.nl). It was a beautiful day to be outside: the sun was shining though it was not too hot and winds were mild and, for the majority of the trip, in my favour. There were moments where everything seemed just perfect: cruising effortlessly down a quiet path, the clouds looked like they were painted, the sunlight reflected beautifully on the moving water and there were loads of swans in the water and other birds flying around. It made my heart beat faster and my breathing stop for a second. Such happy feelings! In addition, it matched perfectly the song on my iPod (some acoustic guitar by José González), but I turned the music off for just a minute to enjoy the sight in silence and hear the sounds of nature instead. Happy bliss! And so, I biked for hours and hours. And it was all really good! Except for the last 15km where I had full on headwinds and I had become pretty exhausted. I swear, grannies were overtaking me at some point! Around 4pm, I arrived in Renesse and I went to my WarmShowers.org host and I set up my tent in the backyard. My tent, a Jack Wolfskin Gossamer, was very easy to set up and I like the tent a lot! However, I’m not sure if it’s perhaps not a bit too small. It’s a one-person tunnel tent; very small and light. But it’s so small that I can’t sit up straight (and I’m pretty short), so changing my clothes in the tent makes me feel like some sort of seal or upside down turtle trying to wing its way into, or out of, clothing. I’ll keep testing this tent during my trip to Southern Africa in two months and then decide whether I will keep it or not. All other stuff was perfect: Thermarest sleeping mat and pillow, Cumulus sleeping bag, a sleeping bag liner from Sea to Summit. I had done some research, so luckily there were not too many surprises here. The biggest surprise of the day was how sunburned I had gotten. Ouch! Lesson learned: (as Baz Luhrmann said before,) wear sunscreen. Lisa joined me in the evening and we had a night’s rest before moving on the next day. On Saturday, we cycled from Renesse to Vlissingen (a little over 40km). It wasn’t too far, but the headwinds were killing. Plus, my legs were still a bit sore from the day before, so I was slowly pedalling behind Lisa, who was much stronger than I was. We arrived at the beautiful boulevard of Vlissingen after about 2,5 hours. Lesson learned: take more photos (I realise I rarely want to stop while cycling, so I forget to take photos and just take mental pictures). We met up with a friend for lunch and in the afternoon we cycled to our Warm Showers host Froukje. It’s a lovely way to meet other people (cyclists) and hear about their adventures. Since I had been cycling and sweating for two days, I also happily made use of the warm shower offered! We relaxed and talked and their cat Gijs came to say hi and receive cuddles. And while unloading my bike, I learned my lesson learned: remove panniers from the right side before removing them from the left side (if your kick stand is on the left side) or your bike will lose balance and fall to the right side. This happened in some kind of slow motion since I saw it happen and grabbed onto the luggage net on the back, which was elastic, so it did not prevent my bike from falling but it slowed down the speed at which my bike was falling. And now, I have scratches on my right pedal (it could have been worse, but still, it hurts). Also, when moving your bike upright again, don’t lift the bike with your feet under the bike as the chain will be wiping onto your pants (or legs), but rather, (Lisa’s advise) place your foot on the left pedal for balance while lifting the bike. So, there were lots of lessons learned in that one moment! In the evening, we cooked dinner and Froukje joined us for a bite. 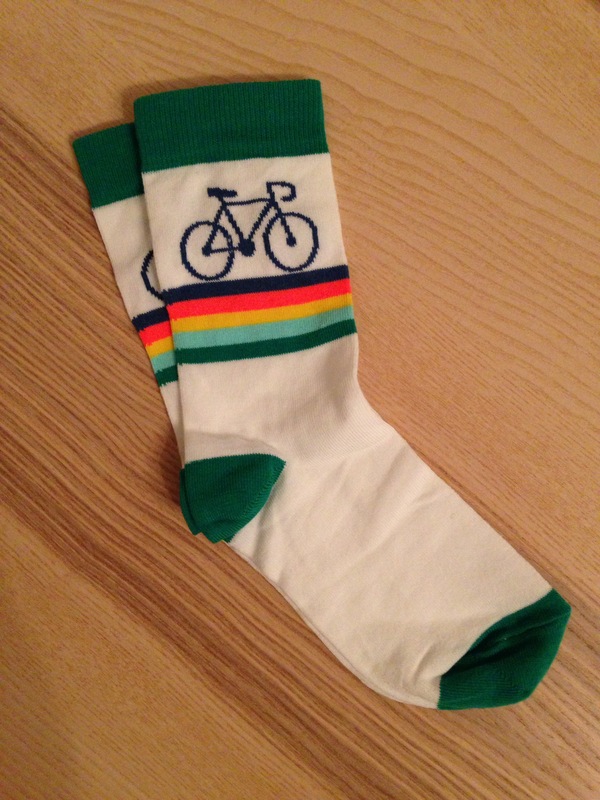 We talked more and we each received a pair of bike socks! They’re really lovely and I’ll bring them with me next year. Today was the last day of the three-day weekend bike trip to Zeeland. Lisa had to go back to Amsterdam early, since she had a lot of work to do. We talked about biking to another city and take a train from there to The Hague/Amsterdam. However, Froukje mentioned that from Vlissingen, Bruges (Brugge) is only 45km away. And I had never been to Bruges. Lisa didn’t want to go too far, cause it would also involve biking back to Vlissingen and taking the train from there. In the end, Lisa decided to take the early train back to Amsterdam so she would be home by noon. And I decided to keep on biking southward. So this morning, I biked to Bruges and I finally stopped to take some photos. The ride there was really nice along the coast and it didn’t seem too hard at all. The city of Bruges is beautiful! I’m so glad I went! I biked around for a bit and then made my way back to Vlissingen, from where I took the train to The Hague. However, I decided to get off of the train earlier, in Delft, and bike the last 15 km back (with headwinds). Total kms of the day: 115km. Total kms of the weekend: 231km. Lesson learned: I love riding my bike!